HomeBacteriologyColony Morphology of Bacteria; How to describe Bacterial Colonies? Bacteria grow on solid media as colonies. A colony is defined as a visible mass of microorganisms all originating from a single mother cell. Key features of these bacterial colonies serve as an important criteria for their identification. Colony morphology can sometimes be useful in bacterial identification. Colonies are described as to such properties as size, shape, texture, elevation, pigmentation, effect on growth medium. In this blog post you will find common criteria that are used to characterize the bacterial growth. Colony Shape: It includes form, elevation and margin of the bacterial colony. Form of the bacterial colony: – The form refers to the shape of the colony. 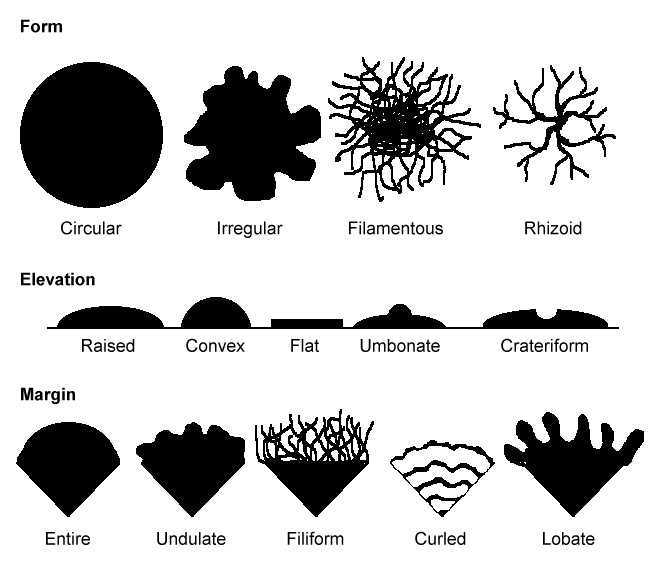 These forms represent the most common colony shapes you are likely to encounter. e.g. Circular, Irregular, Filamentous, Rhizoid etc. Margin of bacterial colony: The margin or edge of a colony may be an important characteristic in identifying an organisms. Common examples are Entire (smooth), irregular, Undulate (wavy), Lobate, Curled, Filiform etc. Colonies that are irregular in shape and/or have irregular margins are likely to be motile organisms. Highly motile organism swarmed over the culture media. Such as Proteus spp. Size of the bacterial colony: The size of the colony can be a useful characteristic for identification. The diameter of a representative colony may be measured in millimeters or described in relative terms such as pin point, small, medium, large. Colonies larger than about 5 mm are likely to be motile organisms. Appearance of the colony surface: Bacterial colonies are frequently shiny and smooth in appearance. Other surface descriptions might be: dull (opposite of glistening), veined, rough, wrinkled (or shriveled), glistening. Color of the colonies (pigmentation): Some bacteria produce pigment when they grow in the medium e.g., green pigment produces by Pseudomonas aeruginosa, buff colored colonies of Mycobacterium tuberculosis in L.J medium, red colored colonies of Serratia marcescens. Opacity of the bacterial colony: Is the colony transparent (clear), opaque (not transparent or clear), translucent (almost clear, but distorted vision–like looking through frosted glass), iridescent (changing colors in reflected light). 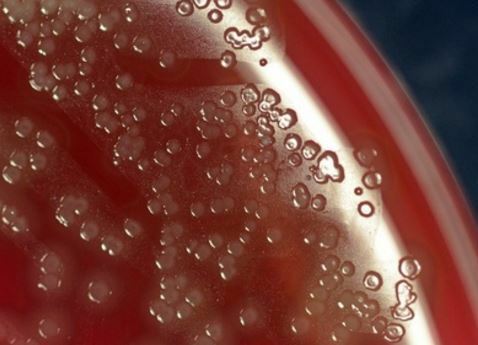 Young colonies of Streptococcus pneumoniae (pneumococci) have raised center but as the culture ages, they become flattened, with a depressed central part and raised edges giving them a ringed appearance also known as ‘draughtsman colonies’. Can you explain how or why certain microorganisms grow into a crateriform colony instead of let say a raised colony? What is the explanation behind each form, elevation and margin? are you have some articel about osmophile yeast sir? which categori of osmophile yeast? 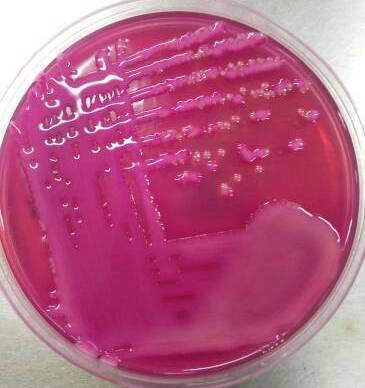 Hi dear do you have any procedure for isolation of Rhodobacter spheroides from environmental samples? Please I need to carry out a virology project. I collected a sample from an object using a swab stick and then I added normal saline water to the swab stick to get a virus suspension. I want to prepare a cell culture using cells obtained from a human blood but I don’t know how to do this. I want to add my virus suspension to the cell culture and then observe under the microscope the changes the virus has caused on the cell shape and number. Please can I get an instruction from you on how to go about this. thank you siirrr, love you!!! baby tanks very many.